Albany Library is thrilled to have Angie Woolman as the instructor for this new series of programming. 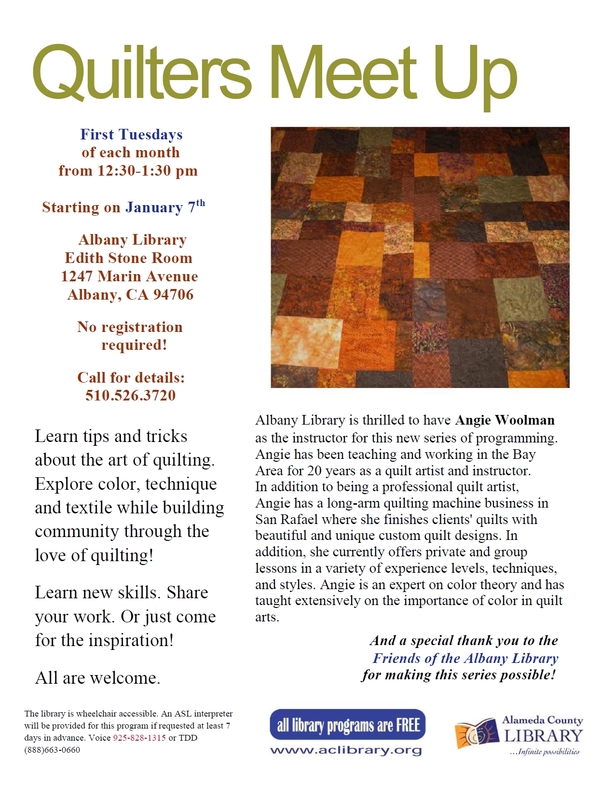 Angie has been teaching and working in the Bay Area for 20 years as a quilt artist and instructor. In addition to being a professional quilt artist, Angie has a long-arm quilting machine business in San Rafael where she finishes clients’ quilts with beautiful and unique custom quilt designs. In addition, she currently offers private and group lessons in a variety of experience levels, techniques, and styles. Angie is an expert on color theory and has taught extensively on the importance of color in quilt arts. No registration required! Call for details: 510.526.3720. Sponsored by Friends of the Albany Library!